The Francis R. Redmond Conservatory is named in honor of the original owner of the Candlelight Restaurant, in which our Food Court, Garden Shop and function rooms are now located. 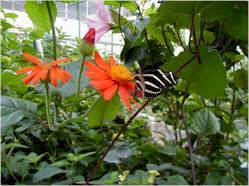 The newly expanded 8,000-square foot conservatory houses nearly 4,000 native and tropical butterflies year round. It is also home to many plants and a pond with a small waterfall and brilliantly colored Japanese carp, called koi. Visitors are delighted with the many different varieties of butterflies swooping gracefully amidst the plants and flowers. Stand still and perhaps a butterfly will gently descend and land on your shoulder, thinking that maybe you are a flower for it to taste. We can't guarantee visitors the rare delight of a butterfly landing on them; we just want everyone to enjoy the peace and tranquility that exists with the butterflies inside this glass house. Magic Wings is a fully wheelchair-accessible facility. Strollers are not allowed in our Conservatory or Gift Shop, due to fire code compliance issues. We recommend using backpacks or snugglies for very young children. Thank you for your understanding.